Biodiversity and Climate Change Adaptation in Tropical Islands provides comprehensive information on climate change, biodiversity, possible impacts, adaptation measures and policy challenges to help users rehabilitate and preserve the natural resources of tropical islands. While biodiversity and climate change of tropical islands has previously received less attention, it is ironically one of the most vulnerable regions in this regard. The core content of the work derives largely from the ideas and research output from various reputed scientists and experts who have recorded climate change impacts on aquatic and coastal life in tropical regions. Contributors have direct working experience with the tribes in some of the tropical islands. All of their expertise and information is compiled and presented in the work, including coverage related to climate change. This work highlights the ever-growing need to develop and apply strategies that optimize the use of natural resources, both on land and in water and judicious use of biodiversity. 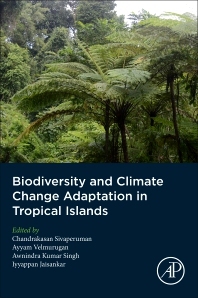 It functions as a critical resource on tropical island biodiversity for researchers, academicians, practitioners and policy makers in a variety of related disciplines. 24. Bioshield: An Answer to Climate Change Impact and Natural Calamities? Dr. Sivaperuman, M.Sc., D.B.T., Ph.D., works as Scientist-C in the Zoological Survey of India. He received his Master’s Degree in Wildlife Biology from Bharathidasan University, Tamil Nadu, and holds his doctorate in Ecology of Wetland Birds in the Vembanad-Kole Ramsar Site from (Kerala Forest Research Institute, Kerala), Forest Research Institute, Deemed University, Dehra Dun. He has worked in various areas of the country in a range of different ecosystems, including Kerala, Rajasthan, and Andaman and Nicobar Islands. He has published more than 140 research papers in national and international journals and newsletters. He has also participated and presented research papers in 30 national and international seminars and symposia. Dr. Velmurugan has more than 15 years of research experience and has been working in island ecosystems for the past seven years. He was involved in the Geosphere Biosphere Programme and National Carbon Project of Indian Space Research Organisation, and successfully completed land degradation management in coastal areas under the Global Environment Facility. His area of specialization includes GIS and remote sensing, biogeochemical cycles, impact of climate change on island agriculture, and providing weather based agro-advisories in collaboration with the India Meteorological Department. He has also guided several postgraduate diplomas, MTech and PhD students in his area of specialization. He has visited and worked in several labs of national and international status and published more than 50 research articles including in journals of international repute. Dr. Singh has more than 10 years of research experience and specializes in genetics and plant breeding. He has wide experience on plant genetic resources, characterization and its conservation, and breeding for abiotic stress tolerance. He has also worked in conservation and characterization of plant genetic resources of tribes of tropical islands. Dr. Singh has documented a number of wild and land pulses and has released several pulse crop varieties suitable for biotic and abiotic stress tolerance. He has published more than 20 peer-reviewed research papers on genetics and plant breeding. Dr. Jaisankar has eight years of research experience and specializes in biodiversity and agroforestry management, presently working on agro-forestry models for climate change adaptations and assessment of biodiversity of tropical forests for bio-prospecting. He has wide experience in biodiversity assessment and use of multipurpose tree species under tropical island conditions, and he has published more than 20 research articles in national and international journals. very good book on biodiversity and climate change about tropical islands. It very comprehensive provides good information about tropical islands. The book is a very source material on biodiversity of islands, climate change impact and other socio-economic aspects. It contains recent data and methodology adopted to study the tropical islands, provides first hand information and interpretation. Very good library materials with global coverage. Excellent compilation and interpretation of biodiversity of different ecosystem of tropical islands. Lots of information is provided abouts its relevance to the island ecosystems, livelihood and climate change adaptation. Simple and lucid english having global readership.